In the continuing trial of the 6 City Harvest Church (CHC) leaders, Chew Eng Han (left), the former investment manager for CHC, took the stand today (26 Jan). Pastor Kong Hee, Chew Eng Han and 4 other CHC leaders are accused of allegedly channelling $24 million of the church’s funds into sham bond investments to further the career of Pastor Kong’s wife, pop singer Sun Ho, between 2007 and 2008. 4 of them are also accused of later allegedly covering their tracks by devising transactions worth $26.6 million, known as “round-tripping”, to “redeem” the sham bonds. Mr Chew is the 4th accused person to give evidence, and is the only one defending himself without a lawyer. Speaking in court, he said he broke away from the church in 2013 as he believed that his co-accused had chosen the “most convenient way” of defending themselves. He said that the 5 co-accused, including Pastor Kong, claimed they did not know about the legalities concerning the bonds, and had pointed to him as the brains behind these bonds instead. Mr Chew said that the “first wake-up call” came in May 2010, after the Commercial Affairs Department had questioned the 6 accused. “When the fire broke out, I didn’t see any leadership, I didn’t see any shepherds. All I saw was fear,” he said. 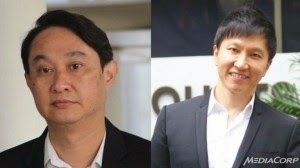 Mr Chew said that contrary to what his co-accused had testified earlier, Xtron Productions which is the artist management company for Sun Ho, was indeed controlled by the church, and that Pastor Kong and Deputy Senior Pastor Tan Ye Peng controlled the decisions made at Xtron. “Why would anyone divest so much money into a vehicle (Xtron) and not control it?” he asked. He added that such an arrangement was common in the financial world. Xtron Productions had issued $24 million worth of alleged sham bonds to CHC to “invest” in. When Xtron could not redeem the bonds, another $26.6 million from CHC was allegedly injected into Xtron in a roundabout way to enable it to redeem the first $24 million bonds issued to CHC earlier. In fact, CHC was using its own money to “pay back” itself, the prosecution charged. Last year, during the trial in August, Pastor Kong claimed that Xtron Productions was independent from CHC. Pastor Kong then argued that as CHC’s founder and senior pastor, he was an “invisible patron” to many organisations and Xtron could be another instance. He added that he was not aware of the details inside Xtron. However, Pastor Kong admitted that he had kept CHC’s investment in Xtron from church members during a 2008 general meeting of the executive members. But he said this was to “protect the church”, since information given to the members “very quickly goes into the public domain”. If the public had known that Ms Ho’s career was being financed by the church, Pastor Kong said, she would be labelled as a gospel singer. This would affect the church’s mission work – which used her secular music career to evangelise (or so he claimed) – in countries like China that frowned on public preaching, he said. “I’m sure if I had told the members (earlier) they would gladly support it,” Kong said.